The A.D.L. Cuff is an adaptive pocket for everyday utensils and is made of 1" (25mm) wide white nylon webbing with hook & loop closure. 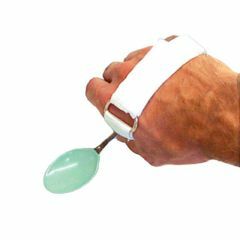 Good for anyone with hand weakness or paralysis but good wrist control. It allows you to slip the utensil into the pocket for easy use.